When we’re in Cannes, we shop regularly at Monoprix, which is in the centre of town across the road from the railway station. Monoprix’s breadmaking is overseen nationally by a MOF (meilleur ouvrier de France) who has an expert knowledge of all types of flour and yeast. You can pick up a small booklet at the bakery counter in which Frédéric Lalos — the MOF — describes each type of bread. I did not eat any supermarket bread in 2015, but somewhere along this timeline, Monoprix must have terminated their contract with the MOF, because what they have now looks and tastes mass-produced. Monoprix’s artisanal breads used to be in the bakery section with the fresh pastries. No longer. This year in Cannes, they are in the middle of the food hall in a separate display. The day we left, I bought a Monoprix baguette to bring home (€0.95 for 400g). We thought it would taste like an artisanal product. Slicing it was the first disappointment. It had a tight, white, soft mass-produced industrial crumb, no different to what one could buy in a North American or northern European supermarket. Ugh. Even worse, it tasted of nothing, despite the fact that the label said it had rye sourdough in it. I should have gone up nearby Rue Meynadier to a proper bakery. Next time I will. Here is Monoprix’s current sad selection of own-brand bread and baguettes. Even the Monoprix Gourmet line looks ordinary. It’s terrible, just terrible. My better half and I have been watching the first series of (what translates as) France’s Best Bakery on the French television channel M6. After having enjoyed an exciting third series in 2015, we are grateful that M6 has made earlier shows available for viewing. The series, first filmed in 2013, involves a regional, then a national, competition among 84 bakeries. Shine Productions makes the programme and uses the same format as they did in Britain’s Best Bakery which last aired on ITV two years ago. I don’t say, ‘Make a thousand baguettes.’ I tell them, ‘Make a baguette a thousand times — the way I taught you’. I get better results that way. That’s a great piece of psychology. The same principle can be applied to anything, not just to bread-making. I shall keep that instruction as a note to self. Many people suffer from gluten intolerance. When I say ‘suffer’, they really do, because they would love to eat the food that everyone else does, from pastries to bread. Where bread is concerned, a number of websites have recipes for gluten-free sourdough starter along with suggested gluten-free flours. Some gluten-free bakers say not to use millet in sourdough starters. However, Natasa Djuric from Slovenia uses it and even has a tabletop flour mill. She makes her own flour. See how she and her boyfriend worked with the starter. In this video, she walks us through his recipe for millet bread with millet starter. In a guest post for Sourdough Surprises, Djuric discusses the different types of gluten-free flour, binding agents and equipment you will need for this type of sourdough starter. Djuric prefers making her own flour with the tabletop mill because grains are cheaper and the flour ferments more quickly. Jeanne at Art of Gluten-Free Baking has two helpful posts beginners will be interested in: ‘Sourdough Starter: Gluten-Free’ and ‘Sourdough Starter/Bread (Gluten-Free) Troubleshooting FAQ’. Jeanne politely requests that people read her recipes and follow her processes thoroughly before writing in with questions. Whole New Mom has a great post on how to make gluten-free starter. She also explains the nutritional benefits of sourdough. And, finally, The Art of Gluten-free Sourdough Baking has an excellent post on making and maintaining gluten-free sourdough in a cold kitchen. Please note that I do not have any personal experience with these flours. If you have questions, please visit the sites and ask the authors. Thanks! Yesterday’s guest post was a primer on yeasts and how they work. I found my good friend’s guidance useful in learning how my sourdough culture was working. In the beginning — around mid-October 2015, before his help in November — things were less clear-cut. What follows is my experience from the beginning to the present. One of the reasons I hadn’t used sourdough was that it seemed to require a lot of space and huge quantities of flour. We only eat bread once a week. I happened to read Weekend Bakery, a Dutch couple’s site, wherein they discuss all things sourdough. That was quite helpful, especially in discovering that one only needs a jam jar for the culture. I was soon on my way with a spotless 400g mayonnaise jar. Ed and Marieke recommend using a strong flour for the starter. They use rye. I, too, had rye flour so used that for the first two months. More on that later. Our kitchen was still warm in the early autumn. Of course, two or three days into my new culture, we had chillier temperatures which soon made our late Victorian kitchen much cooler. SpouseMouse and I decided to put the mayonnaise jar in the airing cupboard overnight. Big mistake. It went mouldy and had to be thrown out. I started all over again and decided to let the new culture live in the kitchen. It would simply take longer to develop but would still live. 1/ Use a clean jar with a lid. 2/ Keep the lid loose. 3/ Cover the jar with a small oven mitt or keep it in a cupboard out of the light. 4/ Keep it out at room temperature until it has fully developed — this might take one to three weeks. You can begin using it after five days, but the final results won’t be as good until the starter matures. I should have fed mine daily for 7 to 10 days; instead I took a break on days 5 and 6. When looks like the starter on the right, photo courtesy of cfaitmaison.com (‘It’s homemade’), it is robust enough to withstand refrigeration. 5/ Use filtered water. All the online sites say that tap water has enough chlorine in it to prevent the starter from growing properly. However, now and then one runs across readers’ comments to the contrary. 6/ During the first two (possibly even three) weeks, feed your starter at nearly the same time every 24 hours. Start with 50g of flour and 50ml of water. Put both in the jar and stir well. Ed and Marieke say stir for 30 seconds each time. For a top up feeding, I put in 30g of flour with enough water to mix easily. 7/ Leave the jar lid loose, because after feeding, the starter will rise and may expand out of the jar. The photo from a Frenchwoman at Ni cru ni cuit (‘Neither raw nor cooked’) shows what can happen. Also notice how hers is more of a paste than a liquid. I am striving for that consistency. 8/ Keep the starter level halfway up the jar so that it has room to rise and expand without making a mess. 9/ The starter will sink several hours after feeding. This is normal. 10/ I did not follow the rule to discard half the starter before refeeding. My chemist friend is not sure why that is specified, nor do some sites’ readers. 11/ Avoid too warm a temperature which can make the starter mouldy. If you notice any mould, throw the starter out and start again with a new jar. 12/ Using a digital kitchen scale helps a lot in getting accurate measurements. Mums who do not have one would certainly appreciate receiving one for Mother’s Day. As I said yesterday, the acetone smell was mildly disconcerting until my friend explained that it is normal and necessary. The acetone smell indicates one of two things: it is time to feed your starter or you need to leave the lid off the jar and keep it in the open air for five or ten minutes. If you have fed your starter recently, try leaving the lid off for a short while. The smell will quickly go away in most cases. If it does not, then feed your starter. Another indicator of feeding time is a layer of water on top of the starter. This normally appears in one that hasn’t reached full strength or one that hasn’t been fed in a few days. Give it a top-up of 30g flour and stir for 30 seconds. It might not need extra water. My starter sits on the countertop and is now in a small 220g Grey Poupon (mustard) jar. I feed it three times a week: 24 hours before baking, then with 30g of the pre-bake starter described in the next section and once in between. I also stopped using rye flour two months after I began as my results were too much pain de campagne and not enough white loaf. I now use T55 flour, with which I bake. Most people using a starter feed it 12-24 hours before using it for a loaf of bread. The night before baking, take 30g of the starter and combine it with 100g flour and enough filtered water to mix into a semi-solid mass. I use a measuring jug and digital kitchen scale. When you are finished, cover the measuring jug with cling film and make a mental note of the level. By the time you are ready to bake the next day, the volume should have doubled. The mix should also be uniformly bubbly. Using a digital scale, put 20 – 30g of the measuring jug starter back into your sourdough jar, stir well and cover. Put the remainder of the starter into a bowl or food processor receptacle and add another 150g of flour mixed with 4g of salt and a scant tablespoon of yeast. Make sure the salt is well dispersed, otherwise the yeast will not work. There may come a time when I do not need yeast, but for now, I do. Start mixing — or blitzing — this together and gradually add warm water as appropriate. I found that I did not need as much water using sourdough starter as I did before. I also use a food processor and do not knead my bread. The sourdough starter also helps the dough rise much quicker. It takes two hours versus four. For the second rise — after two hours — I sprinkle 1-2 tsps of flour on my bread board, flour my hands, portion the dough and gently de-gas it by pressing it lightly then forming into a ball or small squares which I then roll up and shape into baguettes. Normally, I make three small baguettes which I put on lightly greased aluminium foil. My round loaf goes into a round plastic-lined basket. Drape the dough with lightly floured cling film and let rise for another 45-60 minutes. Every baker and pastry chef will tell you how important it is to know the true temperature of your oven. It is well worth shelling out for a cheap and cheerful oven thermometer for this purpose. When you are ready to preheat your oven, place the oven thermometer in it and an empty baking tray into the oven. Set the temperature at 210° C (410°F; experiment with 400° F and 425° F). Bread bakers say it is important for the base on which the bread rests to be very hot before putting the bread on it — hence the empty tray. While you are waiting for the oven to heat, you can decorate your loaves using a lame (blade). Be careful not to slice too deeply. I once fully de-gassed two beautiful loaves. Believe me, the lame makes all the difference. For my birthday, SpouseMouse gave me a little Mallard Ferrière Lame Grignette P/10, which is brilliant. I notice they also make a similar model with a rotating blade for curved slits. These come with a box of razor blades. Check the oven thermometer after five minutes. Mine takes eight minutes to reach optimum temperature, so do not be surprised if yours takes longer than anticipated. Kitchen temperature will also make a difference to the speed at which your oven heats. Once your oven is at the right temperature, you can take the baking tray out, put your bread on it and bake. I just transfer my aluminium foil with the baguettes onto the tray. As I use the no-knead method, I cover my loaves with a large roasting tray (not preheated) that sits flat over the loaves and rests on the hot baking tray. This allows a bit of steam and creates extra rise. I remove it halfway through baking time. Put the loaves into the oven and bake for 40 minutes. They should be golden brown and sound hollow when tapped on the bottom. Put the loaves onto a rack to cool. Smaller loaves take about 45 minutes to cool sufficiently. Besides the professional appearance of the sourdough loaf, another big improvement for the home baker is the oven spring, the increase in volume during the first 10 to 12 minutes of baking thanks to fermentation and expansion of gases. You will also notice the ability of a slice of bread to revert back to its original shape after squeezing it by the top and bottom crusts. Yet another improvement is a near-professional crust and lighter crumb. Of course, you will want to eat your bread on the day you make it. However, if you do wish to reheat a loaf the next day, you can do so by putting it in a 150° C (300° F) oven for five to eight minutes, depending on the size. Let it cool for five to ten minutes before slicing. Homemade bread will keep for 24 hours. Even though I am still learning about it — as well as bakers’ vocabulary — I’m delighted I have my own sourdough starter. If you are undecided as to whether it is worth the effort, it definitely is. You don’t need to be an expert to make your own starter! Last autumn, after watching a television series on French bakeries, I created my own sourdough starter. Having read various websites about feeding and maintaining starter at home, I was confused about the acetone — nail varnish remover — smell. Most sites advise dumping half the starter then adding fresh flour and water to what remains of the original and stirring well. As my starter was still rather young at the time, the acetone smell was frequent. A good friend of mine with an excellent knowledge of chemistry asked one day how the starter was going. I explained my concern about the acetone. He said it was nothing to worry about. In fact, it is part of the fermentation process. Yeasts are naturally-occurring micro-organisms. The strains used in brewing and baking consume carbohydrates and sugars as sources of energy. They produce alcohols and carbon dioxide as part of their digestive processes. In the presence of air, alcohols oxidise naturally in a two-stage process. In the first stage, aldehydes and ketones are produced. These typically have strong aromas. Acetaldehyde smells of pears, whilst acetone smells of nail varnish remover. Many of them are actually used as artificial flavourings for foods. For example, acetaldehyde is used to flavour boiled sweets. In the second stage, and with air still present, the aldehydes and ketones oxidise further to produce acids. It is not possible to produce acids without first producing aldehydes and ketones. Brewers aim to stop this oxidation process, since they wish to retain as much alcohol as possible. A glass of wine, if left standing in air, gradually turns to vinegar, which is another form of acid. However, bakers wish to allow both stages of the oxidation process to occur in order to produce acids, since these are an integral part of a sourdough starter. 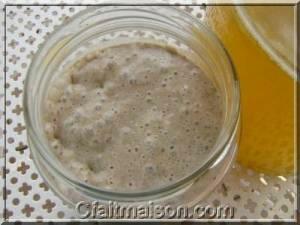 Acids such as lemon juice taste sour; hence the term sourdough for a bread starter that contains acids. Yeasts also grow best in slightly acidic environments, so they are able to live in sourdough starters. However, they also need a continuous supply of carbohydrates and sugars, which is why these starters must be fed regularly. Both stages of the oxidation process can also occur in the human body. After drinking alcohol, the aldehydes and ketones can cause a strong smell on the breath. The acids that are then formed can cause stomach upsets. Most indigestion and hangover cures work by trying to neutralise these acids. With an adequate food supply, yeasts will continue to consume the carbohydrates and sugars. They will therefore produce alcohols and carbon dioxide all of the time. The natural oxidation process is also continuous. So, with healthy yeasts, a sourdough starter will always contain some alcohols at the start of the oxidation process, some aldehydes and ketones that have completed the first stage and some acids that have completed the second stage. It should always have a slight smell. If the smell is very strong, there may not be enough air in the starter for the oxidation process to complete successfully. Under these circumstances, the starter should be left open to the air for a short time, simply to let some carbon dioxide out and some more air in. However, it should not be left open for too long, since the aldehydes and ketones can evaporate, particularly in a warm room. If that happens, there will be nothing left to turn into acids. So, after a few minutes, the starter should be covered again. Overall, the smell of pears or nail varnish remover in a sourdough starter is a good sign. It shows that the yeasts are producing alcohols and that the natural oxidation process to make acids is under way. Do not be put off. I hope that you found this as helpful as I did. Normally, the advice in the penultimate paragraph works. When it does not — and this is the case only if the starter is left unused or unfed for several days — I simply add a rounded teaspoon of flour along with water to the starter and stir well. More about my sourdough experience tomorrow. 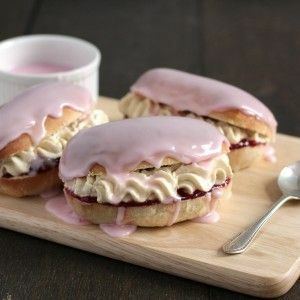 Anyone who finds a certain romance in bread will want to watch the recently-aired three-part series Victorian Bakers (BBC2), if they haven’t already. The series charts the role and work of the baker throughout Queen Victoria’s reign. … come on, it’s bread. Just bread. It pretty much all looks the same, so it’s not televisual. They aren’t making artworks like they do on Bake Off. What emerges from the magnificent bread oven is no-nonsense stuff; fortifying, dull, heavy; a bit like Victorian bakers itself. “For me this is actually tasting history,” says one of the historical experts. After the series ended, Graham wrote an apologetic blurb in her column saying that, actually, the series was rather informative after all. I enjoy watching bakers make bread. SpouseMouse and I are currently watching the first series of La Meilleure Boulangerie de France (‘The Best Bakery’) on M6 which takes the viewer to 84 family-owned firms to find the very best in the nation. I am applying many of their techniques at home in my own bread and pastry making. Back now to the UK and the Victorian bakers. The first episode takes us back to 1837. Three modern-day bakers and one cake maker are put in a restored bake house to make dozens of loaves by hand. Two historians tell them they must use a large, deep trough to mix and prove the dough. There is no machinery, so two of the three men try to cope with heavy bags of heritage wheat flour, getting the contents in the trough and, after water and brewer’s yeast are added, getting everything combined to a smooth, even consistency. Not easy. It involves bending down into the trough and a few hours of back-breaking kneading. The third baker was in charge of the oven, stoking it with wood and maintaining it at the right temperature. If I remember rightly, the cake maker was allowed to help shape the loaves before baking. Overall, it was man’s work. The method for hand mixing dough in a trough is to work a little at time from end to end , I learned that from a bakery tutor in 1982 who had actually done it for a living and delighted in making my class of fellow bakery students perform the exercise. I believe the procedure for checking the oven temperature was to wet your hand and touch the oven sole (oven floor for non bakers). They were fit tough folk in those days too, probably why they didn’t live as long as we do now. Every loaf had to be consistent and edible because most Britons relied on bread as their main foodstuff — every day. The bakers also had to sell their loaves door-to-door. There was no shop. So, after all the backbreaking work, they had to walk around their village or, if in town, their local district. After that, it was back to the bakery to begin all over again. The 21st century bakers surmised that the heritage wheat, whilst making a dense loaf, would have been more nutritious than most wheat available today. They pointed out that there were no gluten allergies then, possibly for this reason. Episode 2 put the bakers in the 1870s during the Industrial Revolution. Although the historians said that bakers’ conditions had improved, the bake house — at the Black Country Museum in Dudley — did not look much different. The huge trough was still there and one of the bakers did what some did in the 19th century: knead the dough with his feet. There was no mechanisation, although there were now coal-fired ovens, which the 21st century bakers said were a huge improvement. By this point in history, being a baker was not considered a very good occupation. Society looked down on bakers in general, possibly because of the additives they had been forced to add (e.g. chicken feed and other questionable substances) when there were poor wheat harvests. However, the historians explained that Canadian wheat was being exported to the UK in the 1870s and sugar from the West Indies was becoming cheaper. The cake maker was delighted to be able to experiment with the new wheat as she made London buns, the closest one could get to pastry or cake at the time. Another change that was taking place during this period was the movement of poorer people from towns and villages to cities for work in factories and mills. Yet another was a demand on the baker from the middle class for lighter, sweeter creations. These two developments meant more business for bakers but much more work. Our 21st century participants found they had to bake through the night to satisfy their customers. In Episode 3, mechanisation finally arrives in the form of the electric dough mixer in 1900. The bakers could not have been happier. The cake maker was able to finally take charge in this episode as she taught the bakers how to make cakes and sandwiches for afternoon tea. They said they were quite relieved they did not have to do that in real life. Bread making was much more their thing — and much easier. We saw how the late Victorians craved brightly coloured icings — the gaudier, the better. The trend persists in commercial British baking to this day. The look was also rather inelegant, which did not bother the Victorians. The unrefined appearance remains the same today and its familiarity reassures Britons of continuity through the generations. Another development in the late Victorian era was the insistence of trade unions on new health, hygiene and safety rules. These brought about a much better working environment. With that came an increased appreciation for bakers, and it was at this time that the number of Master Bakers began to grow. Bakeries now had a clear hierarchy of a knowledgeable boss with assistants who specialised in one task every day. Hats and caps were worn, and the Master Baker had the floppy toque. Some readers will remember the respect and awe they felt when buying bread in the late 20th century and seeing ‘the man in the white hat’ walk from his place by the ovens into the bake shop. Nowadays, nearly all of us buy bread from the supermarket. Another slice of history has vanished. Spa towns in England still have vintage tea rooms which are more popular than ever. If you have the opportunity, make time for afternoon tea. And, if you enjoy bread and history, Victorian Bakers is an excellent series. Watch now to avoid disappointment. It might only be on iPlayer for another few weeks. In 2013, I began making no-knead bread regularly. One year later, I was using a ‘mother’ from previous loaves. French yeast and T65 flour were my new standard ingredients. Since then, I have also made rye bread and ordered T55 flour. Until recently, T65 was the only French flour I could buy in kilo bags. It makes a fine pain de campagne, as I discussed in my 2014 post. However, it does not make a baguette. I bought a kilo of rye bread flour from the miller who sold me the T65. Thinking that the loaf would be too heavy — as it indeed was — with rye flour on its own, I also purchased a 500g of dough improver from him. My rye bread proportions are as follows: 200g rye flour and 50g of dough improver for a lighter, softer loaf in the middle. The crust will still be crispy and pleasing. I do not bake bread as regularly since I started the ketogenic eating plan — low carb, high fat — over a year ago. That said, when T55 — panifiable (bread-making) — flour appeared in kilo bags at Shipton Mill in Gloucestershire, I had to give it a try. 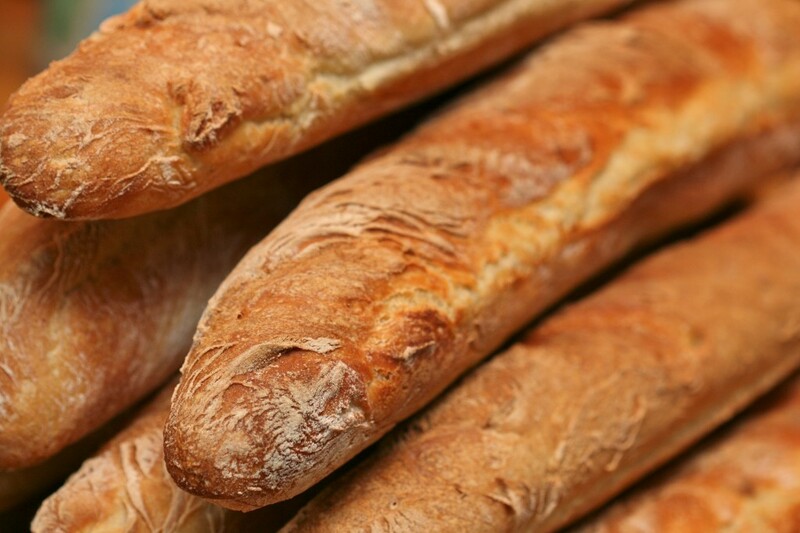 T55 is the flour to use for a baguette texture. The warmer the weather, the better the hole variations. A kitchen temperature of 72°F is optimum. Anything below that, down to 65°F, will need additional rising time. When it is cooler, I let the dough develop for a few hours longer. I’ll keep experimenting and, if all goes to plan, update you in a year’s time. In August 2013, I wrote about my experiences and experiments with homemade no-knead bread. The only times I have bought commercial bread over the past year is when we’ve had hot dogs or I’ve made summer pudding. One requires a soft bun and the other an airy sandwich bread in which to house the fruit filling. One change I made early this year was holding back 50g – 75g (approx. 2 oz – 2.5 oz.) of each dough mixture and adding it to the next. 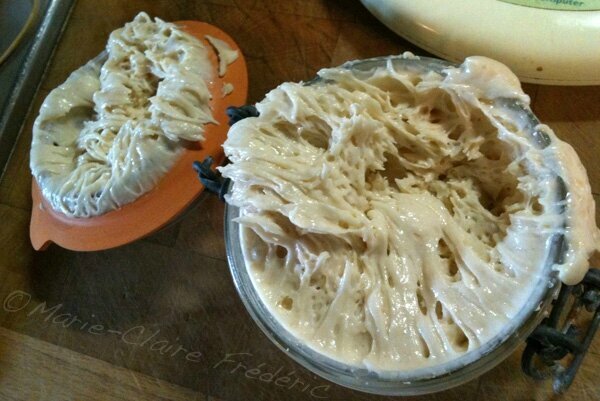 This leftover dough is known as pâte fermentée (fermented dough). My loaves are made with 250g of flour/’mother’ in total. This means that if I have 75g of mother, I add only 175g of flour to bring it up to 250g. Many home bakers probably keep poolish or sourdough cultures going, however, not all of us have the inclination, time or room to do that. The easiest and most space-saving way is to always add a bit from a previous loaf to the next. Many professional bakers do this, therefore, it is a perfectly acceptable way of baking bread. I simply cut the required amount off the current day’s dough and wrap it in lightly greased cling film. It’s important not to wrap it too tightly, just enough to keep the air out of it. It should look like a mini-pillow. Most of the time it goes in the refrigerator, although I have been experimenting with keeping this tiny bundle on the countertop for a day or two until I’m ready to make the next batch. Before using pâte fermentée in a new batch of dough, take it out of the refrigerator to warm up to room temperature. This might take an hour, perhaps slightly longer. When putting it in your food processor with the other ingredients — as I do — cut it up into five to six chunks before mixing. You might also find that you need 10 ml less water, although this will vary with kitchen temperature and humidity. 1/ The crust stays crispier for longer. 2/ The crust is uniformly golden brown. 3/ The centre of the loaf takes on a pleasant, nutty flavour. 4/ Sometimes the bread takes on a noticeable sourdough quality, comparable to San Francisco’s famous bread. 5/ Using it reduces the required salt; you can add 3g instead of 5g. I am still working out why I either get a pleasantly nutty flavour or a sourdough taste. I can leave the leftover dough wrapped, sitting on the countertop in the summer and get nuttiness only. Other times, I have refrigerated the ‘mother’ promptly in the winter and have had a sourdough taste in the next loaf. The loaf after that merely tastes nutty once again. More experimentation needed! Pâte fermentée is not every home baker’s choice. Some see it as ersatz shortcut, because the ferment which develops — acetic acid, an active ingredient in vinegar — is different to that of sourdough, biga or poolish. However, it is unlikely many people outside of highly experienced bakers could tell the difference. For this reason, I would encourage the use of pâte fermentée as a first step in enhancing one’s bread baking, especially when there is scant space in the refrigerator. I keep building on mine as I go. A small part of my ‘mother’ is now seven or eight months old. Ninety per cent of my loaves have been nutty instead of sourdough. As the enzymes in the pâte fermentée take time to develop, I wouldn’t expect any noticeable difference in the flavour until after 12 or 15 loaves. This takes time and is not a magic bullet. There is the fear that any of these types of pre-fermentation — called pre-ferments — can go off. Mine never have, but anyone who sees a discolouration (e.g. pinkness) should discard it and start again. Otherwise, one risks poisoning. We’ve been blessed with a bounty of herbs in our garden this summer. Consequently, I’ve used plenty of them — fresh or dried — in my bread. Per loaf, this works out at a scant teaspoon at most. Chives give a rather sweet taste, not garlicky at all. Chopped sage lends a hint of robust flavour, but the bread still leant itself to being toasted and topped with jam. Marjoram, thyme or oregano add a very professional — and full — flavour profile. The great thing is that, no matter what you use, you’ll really enjoy the flavour profile that garden herbs give to bread. The other nice thing is that they are barely detectable in the loaf, which still looks like white bread, outside and inside. Whatever yeast you buy — and some countries, such as the US, have a wider variety of brands — try to buy it in bulk if you bake bread, pizza or pastries regularly. It’s so much cheaper. I’d been buying boxes of packets for the past couple of years from the supermarket then switched to instant yeast in bulk early this year. As I am using French T65 flour, which produces pain de campagne, it made sense to go for the full French experience. I was delighted to find that I could purchase Lesaffre‘s Saf-Levure in the UK. Saf-Levure gives a reliable, long-lasting rise every time, regardless of kitchen temperature or humidity. It is miles ahead of the leading (only?) UK brand, the performance of which often made me apprehensive. After having been a loyal customer of theirs for several years, I’m sorry to say that, but it is true. My American readers have an advantage in that they can buy Lesaffre’s Saf-Instant Gold for sweeter doughs (e.g. brioche) as well as Saf-Instant Red for bread and pizza. The Saf-Levure sold in the UK also produces outstanding pizza bases, by the way, resulting in a thin, crispy and light crust! I look forward to experimenting more with bread in the coming year and hope to have a further update around this time in 2015. Any comments or suggestions are most welcome. Thank you in advance! Since 2010, I have been experimenting with homemade bread, using a food processor for the dough. I’ve tried recipes requiring kneading and others which have not. I’ve spent hours reading articles and blogs about bread. I’ve watched several television shows and videos on bread. I don’t know how many loaves I’ve made. Some were better than others, but all were edible on the first day. I ate and examined quite a lot of bread when we were in Cannes this year. I could not reproduce them with English flour reliably enough. Temperature and humidity affected the dough too often, turning the end result into a guessing game every time. My readers who use a breadmaking machine might not be interested in this, which is fine. Unlike Paul Hollywood, who told the Radio Times that bread machines don’t make ‘real’ bread, I believe in using what works for you. Furthermore, unlike Paul Hollywood, SpouseMouse and I do not like a crumb exclusively of small holes. We prefer a French mix of large, medium and small holes. A couple of weeks ago, I read and reread a French cooking site’s bread recipes. One thing stood out: I was using a British amount of yeast. The French use 1 1/2 times to twice as much as yeast in their recipes. Their flour is also different. So, thanks to an English miller, I was able to order 1.5kg bags of T65 flour imported from l’Hexagone. There are a few places here which stock it, but they sell 10kg bags of it, more appropriate for a bakery than a household. The other thing I wanted to reproduce was a hot bakery oven to ensure rise and crust. You can use either a small 2 quart size B Le Creuset or similar pot with lid — the lid is essential — or a deep, round cake pan. With this Dutch oven method, you place the loaf in it, cover and remove the lid after 20 minutes of baking. With the cake pan and baking sheet method, lift the pan off after the same period of time. I have tried both and am currently using an aluminium cake pan 8 1/2″ (21.5 cm) in diameter and 3 1/4″ (8 cm) high. Thankfully, after further study, a few tries and some heartfelt prayers, I have a homemade recipe which will be perfect for two or three people. If you are making bread for a larger group, you can double the quantities of flour, yeast and water below. This recipe uses a food processor. Also required, as stated above, is a small Dutch oven or deep cake pan. If you use the cake pan method, you will need a medium sized baking tray. Clean hands are essential when handling dough. Do not work with hot ovens or bake bread if you are under the influence of drugs or alcohol. Also keep children and vulnerable adults at a distance. The oven heat is far too dangerous. Some home bakers use a pan of water at the bottom of the oven or wet baking stones. Whilst I did not try the wet baking stones, the pan of water was much too troublesome for the non-result it produced. That said, if you find either helpful, keep using them. Ensure that you use scales and a measuring jug. Any variation may give unexpected results. I add herbs where some would add a teaspoon of sugar. It’s up to you. If you don’t have French flour, use an Italian ‘0’ or ’00’ flour which has similar properties. 1/ Grease a medium sized mixing bowl for the dough and place to one side. 2/ Measure the flour and salt. Mix well with a spoon or clean fingers to disperse the salt. Too great a contact between salt and yeast inhibits or stops the yeast activity. 3/ Add the pepper and herbs (or sugar) to the flour. 4/ Place flour into the processor mixer bowl. Add the yeast and fat (oil or butter). 5/ Start the processor and mix without water for 10 or 15 seconds. 6/ Keeping the processor going, slowly pour the water into the ingredients at a steady trickle for an even mix. 7/ Once most of the dough comes together, keep the processor going until all the smaller bits incorporate into the larger ball of dough. 8/ The dough will be sticky (tacky). Lightly grease your hands and remove the processor blade. (N.B. : Be very careful when handling blades of any kind. Set them aside in a place far from vulnerable fingers. You need lightly greased hands here to remove any excess sticky dough from the blade apparatus.) Lift the dough out gently and place it in the greased bowl. 9/ Cover the bowl with one or two sheets of cling film (plastic wrap), depending on your film’s strength. Then cover the bowl with an old but clean dishtowel. I use an old, clean butcher’s apron. 10/ Leave to rise for a minimum of four to six hours. The longer you let it rise after this, the greater the variety of holes you will have in the baked loaf. Best results are achieved after eight to 16 hours, although you will have a bakery-quality loaf in any case. You will see uniform small holes and a light texture after four to six hours, with more variety after eight to 16. N.B. : There is a trade-off here between dough manageability, appearance, rise and hole size. After four to six hours, the loaf is still easy to shape into a lovely high-rising boule on which you can put a few decorative slits. After eight, it is still possible although a bit trickier, as the dough starts to relax. After 16 hours, the dough is really slack, so shape the dough the best you can. You’ll still get a boule, just not as high or perfect in appearance — but you will get the rustic holes. The perfect-looking boule (four to six hours) will have smaller holes and the less-perfect one (16 hours) will have the greater variety of holes. For guests, I bake after four to six hours for the best looking loaf! For those wanting baguettes with large holes, you might be better off with a recipe using sour dough or poolish. If you don’t mind a baguette with smaller holes, then shape after four to six hours. In this case, use a loaf pan to cover the baguette on the baking sheet. Follow the rest of the instructions below. After ten or more hours (depending on your kitchen temperature), this large-holed dough will be too slack to shape into a long, thin loaf. You will not be able to adjust the slackness with more flour, because the consistency will be off. Dough development varies with kitchen temperature. Summertime gives a more reliable result for those of us in northern climes. Wintertime brings a cool kitchen, which is likely to produce more variable results, especially for those who hope to bake after four to six hours of dough rise. You might have to wait an hour or three longer. If necessary, preheat your oven to 37° C (98° F) and place the covered dough on the oven shelf, then turn off the oven. The only thing I can suggest is to experiment. Bread does not work as easily at home as it does in a warm television studio! 11/ All bakers say it is essential to release the excess gas before baking the loaf. Do this 20 minutes to 1 hour before baking it. With clean hands, remove the towel and cling film. Lightly grease your hands. Gently — don’t abuse it — fold the dough into thirds. Now do the same in the opposite direction. Repeat these two folds once more and, if you can, shape into a boule. Shaping the four-to-six-hour loaf is easy. Rotate the loaf as you round out the sides. Cover when you have finished. 12/ When you are ready to bake the loaf, preheat the oven to 210° C (400° F). It isn’t necessary to grease either the Dutch oven or the baking tray. Use one of the baking methods below to ensure great crust and good rise. You need heat and depth for this. If you have a four-to-six-hour loaf, gently shape for a final time by lifting the dough out of the bowl and placing it on a lightly-floured pastry board. If you are using the Dutch oven with lid method, carefully place the boule in the centre of it. Slit the top of the boule in three places diagnonally. Cover with the lid and gently place it in the oven. If you are using the cake pan method, carefully transfer the boule to the centre of the baking tray and cover with the cake pan. Gently place in the oven. 13/ After 20 minutes baking time, remove either the Dutch oven lid or the cake pan. Return the bread to the oven. This is an essential step. You’ll ruin the loaf if you don’t. N.B. : The Dutch oven and baking tray will be dangerously hot by this time. Make sure children and other vulnerable people are out of the way. Ensure that you use highly durable oven gloves or mitts for this operation. Otherwise, you will burn yourself, possibly requiring medical attention. Do not use dishtowels as oven mitts for this — ever! 15/ The loaf must rest for an hour on a rack. The rack ensures even circulation of air around the loaf, which is necessary for a good crust. I have made the mistake of putting the loaf on a bread board straightaway; the crust went soggy by the time the loaf cooled. N.B. : I watched Michelin-starred chef Raymond Blanc’s BBC2 show on baking (July 2013). He said that bread continues to bake after it comes out of the oven, which is why air circulation and sufficient resting time are so important. 16/ After an hour, slice, eat and enjoy. You can get more slices out of this loaf than you would with a store-bought loaf. Although the bread is not heavy, thinner slices give a better dining experience. To reheat the next day, place the remaining loaf on a clean oven rack for five to seven minutes at 150° C (300° F). There is no way to make a bread-baking post short. Bread requires precision. I also wanted to explain what works for me and what does not. Comments will be open for two weeks if you have anything to add or to ask. The beauty of this recipe is that you can prepare the dough before you go to bed and bake a loaf in the morning. Alternatively, prepare it before you go to work and bake bread when you get home in the evening.